Invented by nature, crafted by orchards and styled by artisans - Snowgoose extraordinary hamper experiences give the rare gift of slowing down for a moment, to pause and indulge in life's simple luxuries.Exquisitely presented and delivered to impress, each delicious gift hamper teems with the finest quality produce from top growers and artisan providores. We're proud to bring you these delectably different gift hamper ideas. Handmade and thoughtful, they're a complete delight to receive. We hope you enjoy browsing our online collection of over 30 gift hampers and baskets as much as we enjoyed creating them. Delivering your thoughts and wishes in a memorable way for birthdays, congratulations, Christmas, anniversaries, condolences, special events, corporate gifts and every occasion when someone deserves cherishing with the finest gourmet gift hampers. 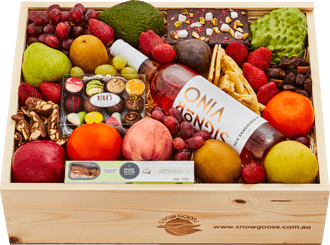 If you've never given or received a Snowgoose gourmet hamper before, then you're in for an absolute treat! We call them 'Gifts of Taste' because they truly are multi-sensory experiences. 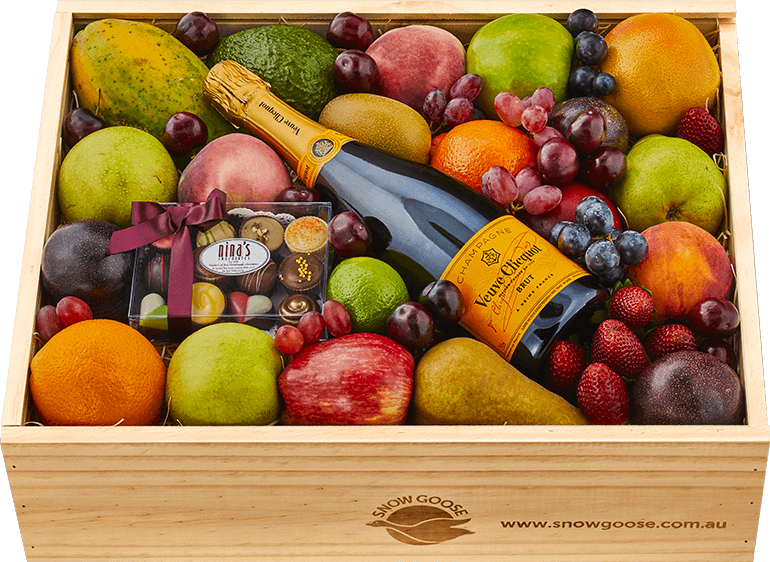 At the foundation of our gift hampers lies an abundance of our famous fruit. Now, this is not just any old fruit. It's Australia's finest and freshest, handpicked at the point of perfection and delivered to your recipient within 48 hours of plucking them from the tree. Each piece is flawless and supremely sweet, delivering incredible orchard aromas and flavours. 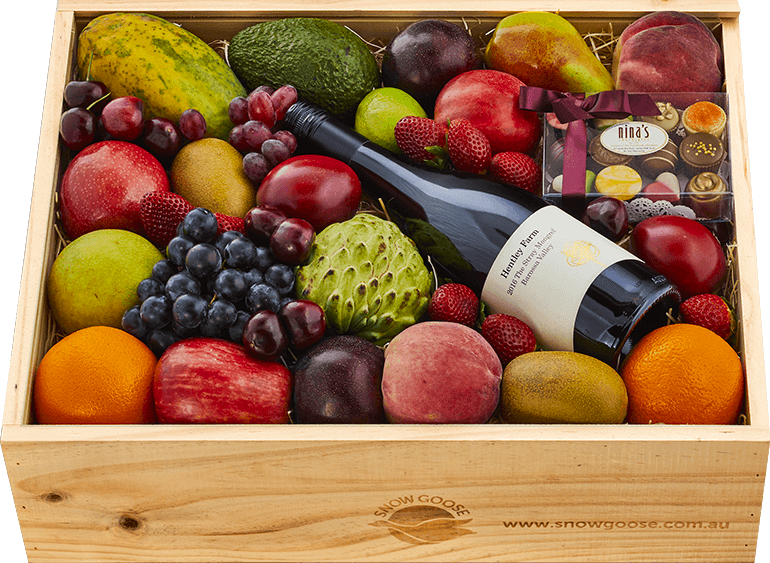 To complement our amazing fruit, we've curated a range of hamper experiences to take taste buds on heavenly journeys of discovery. 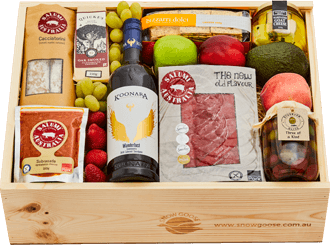 Many say they're unique, but hand on heart our gift hampers truly are delectably different. That's because we're obsessed with travelling our sunburnt land to unearth Australia's best-kept gourmet secrets. As all chefs and foodies can testament, the origins of produce and the stories of creation are part of the taste experience. That's why we select artisans who share our passion for quality beyond compare. From a selection of handmade farmhouse cheese to artisan chocolates that feast the eyes as well as the senses, you'll discover incredible treats that help your recipient to relax and indulge in style. Our sommelier has selected a bottle of SignorVino Sangiovese Rosé, a dry yet luscious and berry-driven Rosé with aromas of strawberries and cream and a hint of cinnamon, leading to a palate driven by Turkish-delight smokiness. To complete the experience, we've selected a bottle of Koonara Wines' 2014 Cabernet Sauvignon - Wanderlust. Generous and thoughtful, we guarantee this Gift of Taste is one they'll always remember.